December 8, 2017 San Diego, CA – ATP Flight School, the nation’s leader in providing the most efficient training path to a successful airline pilot career, has added King Schools online video courses as a key element in their Airline Career Pilot Program. On sign-up, students will get a head-start with the King Schools Private Pilot Ground School and Test Prep Course. Then, when they start their flight training, they will be enrolled in the King Schools Private Pilot Practical Test Course, which provides HD video showing a model checkride with an FAA examiner using the new Airmen Certification Standards (ACS). And to provide a leg up in operating the Garmin 430, the standardized GPS platform in the ATP fleet, students will also receive the King Schools Garmin 430 Online Video Course. 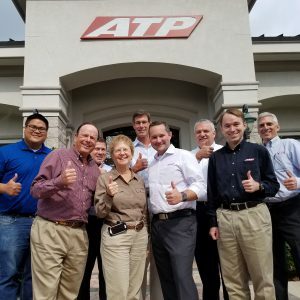 The King Schools and ATP teams enjoy an all clear for takeoff moment at ATP’s Florida headquarters . All three courses are integrated into ATP’s online student portal, where students go for handy access to resources needed during their training. “We’ve gotten rave responses from our students about the King video courses,” said Justin Dennis, President of ATP. “We take students from zero time to an airline cockpit in about two years. To make that happen we have to be organized and efficient. The clear, simple and practical King courses will be key in helping us accomplish that. We are looking to expand our use of King online video courses in the future,” continued Dennis. For over 40 years, students and pilots at all levels have enjoyed King Schools´ clear, simple and fun video courses. King Schools estimates that over 50% of the pilots flying in the U.S. today have learned with King. The company is also a leader in on-line pilot certification and avionics training for pilots of high-performance and turbine aircraft. ATP’s Airline Career Pilot Program prepares pilots for airline careers from zero time to 1,500 hours, with CFI jobs and airline employment. 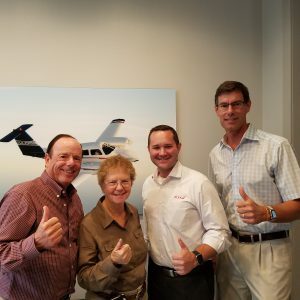 Addressing the pilot shortage, airlines attract new pilots to the industry with ATP’s Tuition Reimbursement Program, where airlines sponsor a portion of pilots’ flight training loan repayment. ATP also provides type-rating and ATP CTP certification. 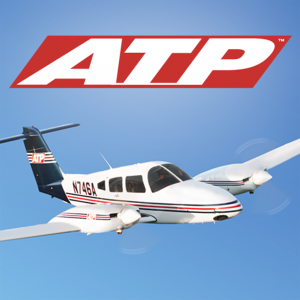 ATP’s 300 aircraft fly over 211,000 hours annually to provide nearly 5,900 FAA pilot certificates each year. As America’s largest flight school, ATP is the leading supplier of professionally trained pilots to the nation’s regional airlines. This entry was posted in King News, King Press Releases on December 8, 2017 by Pilot One.